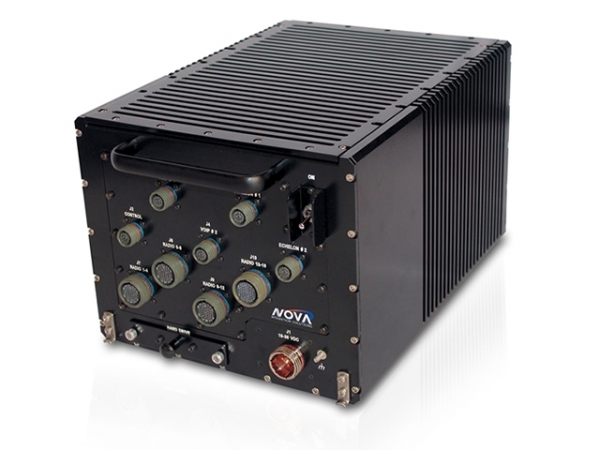 The Nova Integration Solutions (NIS) Class 3100 contains a portfolio of sealed, conduction cooled ATR reference designs conforming to standard ARINC 404A sizes (1/4 Short to 1 ½ Long) while also being fully scalable and capable of housing all Eurocard board types, form factors and slot counts. NIS engineering specializes in advanced thermal management and packaging techniques with the design process starting by considering the most efficient cooling method based on the environment and program specifications. Prior to PDR, FEA thermal analysis presentations are shown validating the design direction under worst case scenarios (high altitude, high ambient temperature and full power load). Heat sink geometry (thickness, length and orientation) as well as heat piping or advanced materials are considered if necessary. When more aggressive cooling is needed the Class 3200 is recommended which offers air cooling over a conduction cooled chassis. The Class 3100 ATR Chassis accommodate up to an 18-slot cPCI, VME, or VPX backplane. Fully compliant with IEEE 1101.2, the internal subrack is fully machined and ready to accept various types of wedgelocks for 3U or 6U convection-cooled plug-in boards on 0.8”, 0.85” or 1.0” pitch. Model 3100 Custom Coming Soon! Model 3110 Dwarf Coming Soon! Model 3120 ¼ Short Coming Soon! Model 3125 ¼ Long Coming Soon! Model 3130 3/8 Short Coming Soon! Model 3135 3/8 Long Coming Soon! Model 3145 ½ Long Coming Soon! Model 3150 ¾ Short Coming Soon! Model 3160 1 Short Coming Soon! Model 3165 1 long Coming Soon! Model 3170 1 ½ Short Coming Soon! Model 3175 1 ½ Long Coming Soon!